Further signs of 'unity' tensions as PA security forces arrest 100 Hamas members organizing 'Naksa Day' event; Hamas arrests Fatah activist. 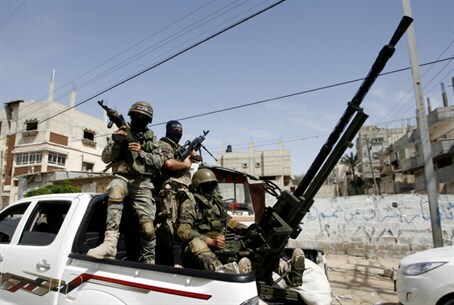 The tensions between the Palestinian Authority (PA) and Hamas, despite the newly founded unity government on Monday, were displayed on Thursday as PA security services arrested Hamas members in Hevron located in Judea. Members of the Gaza-based Hamas terror organization tried to organize a large event in Hevron for "Naksa Day," the annual demonstrations against the 1967 Six Day War liberation of Jerusalem, Judea, Samaria and the Golan Heights by Israel. PA security forces took the arranged event as a challenge, and according to Hamas roughly 100 members of the group were arrested in Hevron, reports Walla!. In the last two days Hamas reports that five other activists of the organization and three others were taken in for investigation. One of the arrested members reportedly was released by general intelligence three days ago, only to be re-arrested two days later by the Palestine National Authority's Preventive Security Service. Due to the arrests, the planned Hamas event in Hevron never came to fruition. Meanwhile in Gaza, Hamas security forces arrested a central Fatah activist who returned to the area through the Rafiah Border Crossing from Egypt. The issue of military control remains a central point of contention in the new unity government. Hamas stated in May that it would maintain control of its "military wing," the Al-Qassam Brigades, despite the unity pact. Another sign of tension was seen on Thursday, when Hamas closed banks in Gaza after fistfights broke out between Hamas and Fatah employees. Hamas employees were disappointed to find their back-logged salaries had not been transferred by the new unity government, sparking the clashes. PA security forces spokesman Adnan Dmeiri warned the incident could have negative consequences on the unity deal, saying "thugs and gangsters of Hamas are preventing civil servants from withdrawing their salaries. They are firing gunshots, beating citizens and smashing ATM machines." Hamas deputy leader Moussa Abu Marzouk said later on Thursday that Qatar had agreed to pay the June salaries of the Hamas workers, effectively defusing the issue temporarily. The new unity government has said the Hamas workers need to be vetted by a committee before being added to the payroll. The new unity government faces an additional issue - the upcoming elections for president and the parliament. Israel has expressed clear opposition to allowing the elections in eastern Jerusalem, leading to a likely tension between Fatah and Hamas over the legitimacy of the elections, which would place the government's future in heavy doubt. While the US has said it "would work" with the unity government, claiming Hamas members are not part of it, three of the new ministers are backed by Hamas and were sworn in via video feed from Gaza. Hamas has adamantly expressed in the past it will control the government.